Let me start by saying it was never my intention to make and post a green bean casserole recipe for this blog. There are hundreds, if not thousands, of recipes out there claiming to be the best, better than Campbell’s, better than your mother’s, and most are completely made from scratch. The world didn’t need another one. Yet here I am, posting one. Because I needed to use up a lot of green beans and I happened to like the way it came out. You see, when Brent and I do our major bulk shopping trips, we always pick up some frozen vegetables. Sure, we prefer fresh, but some nights you just don’t feel like shopping so we keep a few options on hand. We decided it was a totally wise decision on our part to buy a 5lb bag of frozen whole green beans for two people. It’s been 3 months and we still aren’t through the whole bag yet. 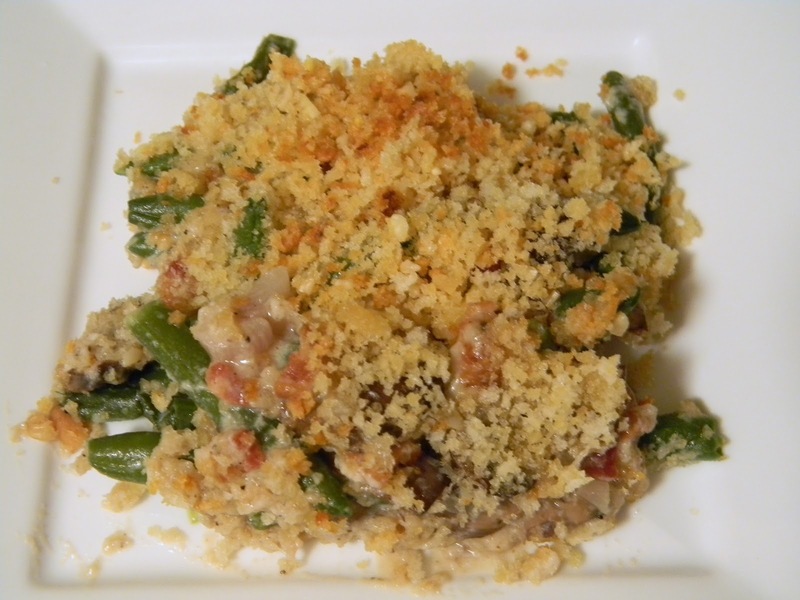 So one night I decided to take a stab at making green bean casserole since I had mushrooms to use up as well. I can’t tell you what the hell else I made for dinner that night and I might never make the original version again. Even though I always did doctor that recipe up a bit anyway. It’s good, maybe not the best, but I did add bacon to it, so it does have that going for it. BUT you can totally leave it out of you are a vegetarian. Just substitute with more butter =) Win-win! So below is my recipe that I totally threw together and it ended up coming out pretty good. For the record, I was planning on frying my own onions up for the top, but Brent said that was ”ridiculousness” and we decided on the panko topping listed below. Which I thought worked pretty well because you need that crispy onion topping on a GBC. Also, if you want to use fresh green beans instead of frozen, just blanch them first and you should be good to go. 1- In a large sauté pan over medium-high heat cook sliced bacon until crisp. Remove with slotted spoon – leaving the grease in the pan – and set aside in a medium bowl. 2- Turn heat to low and add shallots and garlic to pan with bacon drippings. Sauté for 4-6 minutes or until shallots have softened. Remove with slotted spoon and add to reserved bacon. 3. Still using the same pan, bring heat up to medium and add 1 tablespoon of butter. Add mushrooms and cook until lightly browned, about 5-7 minutes. Remove with slotted spoon and set aside. 4. Melt another tablespoon of butter to pan. Add flour and whisk together to make a roux. Cook together for about 30 seconds or so, then add milk and whisk together to incorporate. Bring heat to medium high and allow to come to a low boil, whisking occasionally. Whisk in nutmeg and Dijon mustard and allow to cook for 8-10 minutes or until sauce has reduced and thickened. Taste sauce, and season with salt and pepper to taste. 5. Turn off heat and stir in reserved bacon, mushrooms, shallots and garlic. 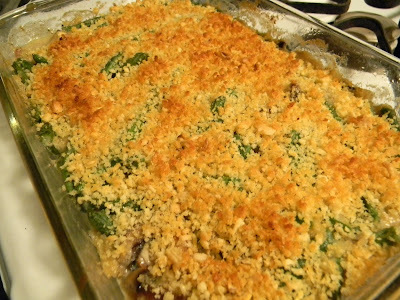 Fold in greens beans and place in a glass baking dish. (I used a 7x11.) Bake at 350 degrees for 30 minutes covered. 6. After 30 minutes melt 1.5 tablespoons of butter in a sauté pan. Add garlic powder and onion powder and stir to incorporate. Toss in panko and toast for 2-4 minutes. 7. Remove green beans from oven and spread panko bread crumbs over the top. Return to the oven, uncovered, for 10-15 minutes or until top is golden brown. Remove from oven and let stand for several minutes before serving. Follow Kitten with a Whisk on Facebook and Twitter! It's fun, I promise.